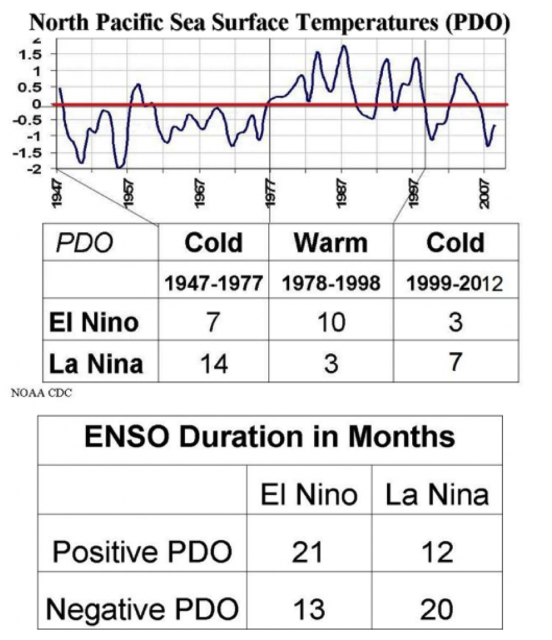 There is a relationship between strength, duration and frequency of El Nino and La Nina events depending on the PDO. The PDO is a multi decadal cycle. Meaning the phase of the PDO doesn't change daily or on a yearly basis. It takes decades. We are now in the cold mode, favoring La Ninas. Cold and warm PDOs and El Ninos have the opposite patterns for temperature and rainfall/snowfall in the mean. "three UK researchers report that the model: (1) "significantly underestimates changes in some regions, particularly in winter across large parts of Asia," (2) "has a tendency to overestimate changes in the frequency of hot days in both the [a] winter and [b] summer seasons over [c] most regions, and in the [d] global and [e] hemispheric mean," (3) "also overestimates changes in the frequency of warm winter days on larger scales," while with respect to changes in cold extremes the model (4) "does underestimate them in some regions," while (5) "there are some regions with trends of the opposite sign." In addition, they say that (6) "the particular regional trend pattern, often also referred to as the 'warming hole,' is not evident in the simulated trend pattern," citing Pan et al. (2004), Kunkel et al. (2006), Portmann et al. (2009) and Meehl et al. (2012). And they indicate that (8) "the model shows a tendency to significantly overestimate changes in warm daytime extremes, particularly in summer." Take a look at the negative PNA and La Nina combo. Its a torch trap for the East and a nice cool trough for the west. But don't forget... weather and climate is from a marriage of things. Like a deck of cards, you need more than one card for a full deck or a winning hand. So are you saying the next decade will favor La Niñas over El Niños? At least according to the sources you're posting. Not sure about the timeframe but next phase to warm will favor El Ninos more. Consider these phases when looking back at climate and weather data. I'd love to see the actual temp results from a location or the country during these phases to see how close it is. Obviously if the chances are higher to be cool in the East during ElNinos, that should show on the results stats. Maybe a new project for me. Also to note.. I did a graph on when the PDO flipped to warm and the snowfall results those winters. It can flip for the season or month but the yearly average or overall phase will not change until it shows it year over year. Also remember there are different strengths of ENSO. A Strong Nino wont be same as a weak one. Most obviously, the correlation between ENSO and the SMT is strong (more so even than I expected). La Niña winters tend to be cold, with the intrusion of modified arctic air more likely to occur, and El Niño winters tend to be mild, with modified arctic air intrusion much less likely. The stronger the ENSO event, the more influence it seems to exert on the ability of modified arctic air to enter our region"
"So it's true: El Niño brings mild winters for our gardens, and La Niña brings cold ones. But these are generalizations, not guarantees! As evidenced above, the risks are significant. And forget about making plans for winter under ENSO-neutral conditions - just batten down the hatches and hope for the best!" PDO has a significant impact on global temperatures. So it's true: El Niño brings mild winters for our gardens, and La Niña brings cold ones. It seems that really cold years are associated with near neutral conditions. The coldest year in the 1990s occurred after an ENSO neutral in the fall. The coldest year in the 1980s occurred after an ENSO neutral in the fall. The coldest year in the 1970s occurred after a moderate La Niña in the fall. The coldest year in the 1960s occurred after an ENSO neutral in the fall. Last edited by Glacierx; 09-11-2013 at 04:17 PM..
Yup, It actually flipped to warm last year and went very warm over winter. research shows when it does flip to very warm, winters are very intense in the Eastern U.S.
May number is out and once again it warmed. Now 1.2. Could this be the turn into a warm phase? We're most likely heading into a Warm Phase now. Don't forget, there are cool down periods inside a warm phase, its not always warm. And CG said it last year as well... Both sides looking like they are ready to switch.. Atlantic Cooling, Pacific Warming. Probably why we seen record low Hurricanes in Atlantic as well. And record amount in Pacific.